The Peninsula & Area Agicultural Commission, together with the Direct Farm Marketing Association, the Capital Region Food and Agiculture Initiatives Roundtable, and Farm Credit Canada, welcome Elaine Froese to present a seminar and workshop on Farm Succession. This is an opportunity to connect and join with others who are interested in promoting and supporting food literacy in our community. This is the second gathering of what we would like to be an ongoing series of conversations. You are invited to attend a free 2-day workshop on March 12 and 13 to learn how to get your growing operation CanadaGAP Certified and find out how to pass a food safety audit. This is an opportunity to connect and join with others who are interested in promoting and supporting food literacy in our community. This is the first of what we would like to be an ongoing series of conversations. Join your local farm and food growing community to discuss climate change and adaptation strategies. An evening of food stories in support of the Good Food Network. CLICK HERE to learn more. Our main conference day will be taking place at the University of Victoria’s Students Union Building. Join us for a day of networking, workshops, updates on the Good Food Strategy and a local lunch! TICKETS ARE NOW SOLD OUT - Tickets are still available for SAVOURY STORIES and spots still remain on the Meet the Network Tours. If you would like to be put on the waitlist for the Main Conference Day, please e-mail engagement@crfair.ca. Field trips to see the good food work of network members first hand! Spaces are still available in both tours. Click on the button below for more details. Experience a fantastic weekend of local food, music, farm-life, community history and, of course, bounty from land and sea. You are invited to a community roundtable on Food Literacy! Since 2015, the Good Food Network has organized this annual roundtable to highlight the work going on around the building of food knowledges and skills in the Capital Region. Come share what work you have been doing and get updates on projects such as Farm to School, community kitchens, and everything in between. Discussion will include the topic of food metrics; how do we measure our success? Register now. Join this celebration of Indigenous foods from Vancouver Island. CRFAIR is a proud sponsor and collaborator for this event. June 1 from 10 A.M. - 8 P.M. and June 2 8 A.M. - 4 P.M.
For more info, contact Ali Fontaine at indigenousfoodsvi2018@gmail.com. Save the date! 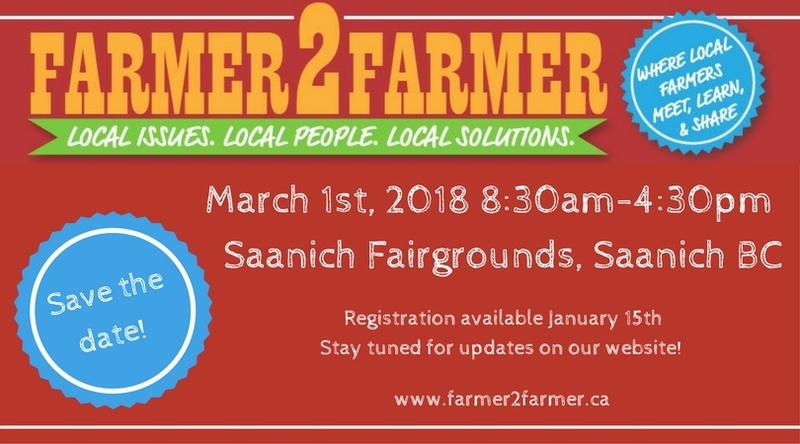 Farmer2Farmer 2018 is coming up on March 1st at the Saanich Fairgrounds. Registration will be available in January. Information about program proposals, sponsorships, exhibitors, and more can be found at www.farmer2farmer.ca. The Good Food Network will be tabling at Victoria Seedy Saturday, selling our awesome canvas bags and promoting network membership. This is a fantastic event for finding quality seeds, plants, and supporting local businesses/farmers. Hope to see you there! The Good Food Network will be tabling at Saanich Seedy Saturday, selling our awesome canvas bags and promoting network membership. This is a fantastic event for finding quality seeds, plants, and supporting local businesses/farmers. Hope to see you there! Whole Foods Market Victoria will donate 5% of its net profits on January 11th to the Good Food Network! Supporting the Network ensures cost-accessible events, resources, and network development. Come to shop and say hi! Join us for this annual gathering of Good Food Champions! November 16-17 at the Songhees Wellness Centre (Esquimalt). Registration available September 25th. The Youth Food Network is in need of donations to ensure its events and opportunities are accessible to all. Please Donate! Come out for our Annual Urban Food-Garden Tour! An inspiring and foodie tour has been planned just for you; with over a dozen home food gardens opened up for public walk through... Enjoy this wonderful event with friends, family, or on your bike! Each garden has a unique layout, plant selection, and feel. You will get to experience Vicoria's Food-Garden culture! This fundraiser supports sustainable food locally at Haliburton Community Organic Farm, 1UP Single Parent Resource Centre, and globally at Hlekatani Community Garden, South Africa (See The Thinking Garden for more details). Tickets $15 (under 19 free) at GardenWorks locations,brownpapertickets.com, or email us at jopifarm@gmail.com. Remember to keep nurturing your zucchini to enter in the Saanich Fair Zucchini Races this fall! 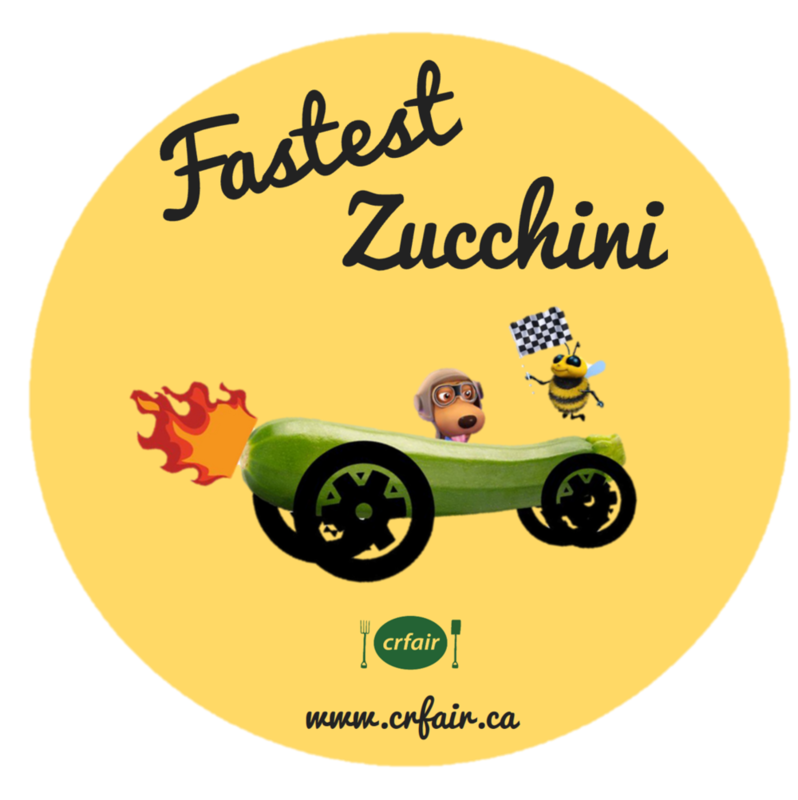 Register on Eventbrite at https://zucchini-races.eventbrite.ca and bring your decorated zucchini to the Saanich fair between 11am and 4pm any day, or on September 2nd at 2 pm to take part in the Zucchini 500. There are prizes to be won! Join us for the 2017 North Saanich Food and Farm Festival! get out on the Flavour Trail and enjoy the delicious flavours of the Saanich Peninsula. More information to come soon! Come join movers and shakers, pollinators and connectors, convenors and change makers, thought leaders and folks who are new to food systems change for this year's 19th Annual BCFSN Gathering, which will take place from July 14-16 on the traditional, ancestral, and unceded territory of the Musqueam people. come taste the strawberries of Saanich! Part festival, part rural ramble, and fully an event for all ages, the Saanich Peninsula STRAWBERRY BUZZ FESTIVAL, June 24-25, 2017 is a signature Flavour Trials festival consisting of a FREE self-guided flavour trail tour and TWO fantastic special events. Take in the STRAWBERRY BUZZ FESTIVAL by bike or by car, exploring the peninsula at the peak of strawberry season! Meet the growers and makers, enjoy free food and drink samples, take in a farm or winery tour, catch some great free music, and enjoy fun kids activity and farm animals. Most of all, pick, buy and bring home strawberries and other delights to fill your pantry. Download the Strawberry Buzz Festival guide and map at www.flavourtrails.com and star...t planning your flavour trail route to the participating farms, wineries, cideries, distilleries, markets and cafes. Hard copies of the guide and map can be found at local markets, cafes, businesses, and community centres, and will be available at all stops on the festival route. Family Strawberry Pancake Breakfast. Sunday, June 25 at Dan’s Farm Market, 2030 Bear Hill Rd. (at Oldfield Rd.). $8 adults, $5 kids. Real pancakes piled high with real strawberries picked from Guite Farm down the road, and topped with real whip cream . . . it doesn’t get better!! This and music, kids activities and farm animals! No advance tickets required – – just come on down and we will serve up the goodness! Check out our event on Facebook and see you on the Flavour Trail!! Local food community members are in the process of exploring the history of colonization and its impacts relating to land and the foods of this territory. You are invited to participate in a two part series offered specifically for food system leaders and champions to explore the history and impacts of colonization through an indigenous lens. We will be doing two sessions the first is a Blanket Exercise http://kairosblanketexercise.org/ and the second is a debrief session to unpack the issues and relate the reflection to our practice as food system actors and leaders. Seats are limited - Reserve yours today! eringer@crd.bc.caThe cost for the two workshops is $25 (subsidies are available if needed, we don’t want cost to be a barrier) The contribution goes to support the facilitator/elder honoraria. Choose May 18 or May 31 1 to 4 pm with debrief on June 2. Special Youth session June 3 10 am to 2 pm. There has been developmental work over the past year to advance regional food systems metrics and the potential for measuring change over time. This is of interest to the Good Food Network, the Regional Outcomes Monitoring group as well as the Food Funders Network, Community Social Planning Council, and local governments who have/are developing strategies for food systems. CR FAIR has initiated a meeting of key interested parties to begin discussions on a potential framework, the intersect with diverse interests to maximize its utility, as well as determine what resources and capacities could be brought together to advance this agenda. Please call us if you would like to discuss this further, or have ideas for others who should be invited to the meeting. We will provide you with a draft of the research and work on metrics to date developed by CRFAIR in partnership with the Victoria Foundation in advance of the meeting. We would like to introduce you to the Island Pollinator Initiative, which will serve to support the ongoing coordination of all our pollination work. The Peninsula and Area Agricultural Commission (PAAC) and Pollinator Partnership Canada (P2C www.pollinatorpartnership.ca) are starting a coalition group called the Island Pollinator Initiative (IPI). Join us for a roundtable discussion! Location: CRD Building: 625 Fisgard St, on the territories of the Lekwungen Peoples. Get ready for a whole season of wonderful food/farm/wine events!! Flavour Trails are community celebrations that provide opportunities for residents and visitors to experience and taste the quality and creativity of the Capital Region's farmers, fishers, food producers, chefs and vintners. Visit www.flavourtrails.com for up to date information on events. Shop for locally grown, organic seed from over a dozen of the islands’ finest seed producers. You’ll also find an abundance of other delightful and delectable things to grow from tubers, corms, bulbs, whips, and starts, all sold by knowledgeable locals and suited to our coastal climate. And who knows what else you may find? Last year’s show featured live bees and chickens. You’ll also find things that will help you grow better: tools, soil amendments, and buckets of new ideas. Bring your gardening problems and mystery plants to the Master Gardeners for wise advice. Talk to the vendors, because the people selling those plants and seeds are the people who grew them: they’re an excellent source of advice about growing your new acquisitions in our climate. Check out the many local garden societies, volunteer opportunities, and educational programs available to Victoria gardeners. And the talks! Don’t forget the talks: they’re many people’s favourite part. We run a full speakers’ program all day, with all talks included in the cost of admission. Hear some of the islands’ finest and most innovative growers talk about everything from basic techniques for beginners to more specialized topics for the advanced class – all with an environmentally-conscious, earth-friendly approach. The ever-popular seed exchange is Seedy Saturday’s heart. Trade extra saved seeds from your garden for something you’ve never tried before. A few years ago we added a book exchange, which works on the same principle: bring in garden books you’ve outgrown and trade them for ones that suit your current interests. You can stay all day (lots of people do), listening to talks and browsing the exhibits. We’ve got the Seedy Cafe on site to keep you going, an ATM in case you suddenly spot a must-have fruit tree, and a kids’ activity area. Yes, bring the kids – you can’t train up young gardeners too soon, so anyone under 16 gets in free. 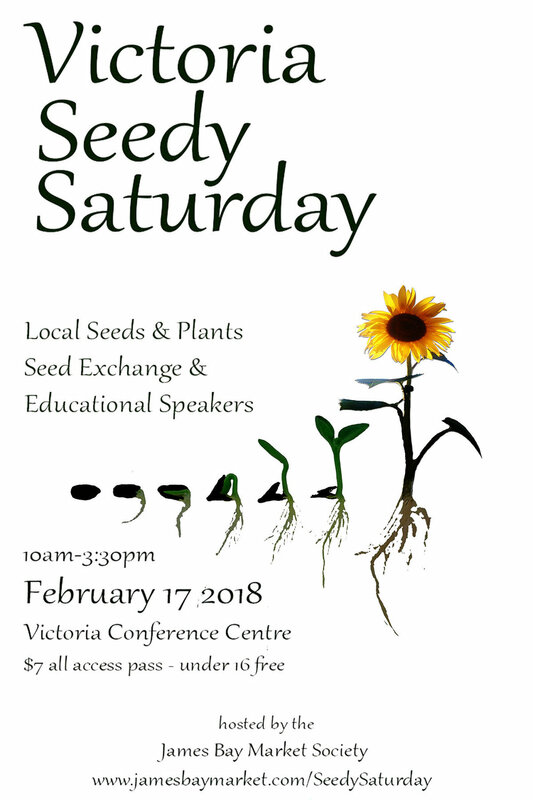 Please do join us on February 18 for Victoria’s Seedy Saturday, the gathering of Victoria’s gardening clans. It’s inexpensive, inspiring, exuberant and, best of all, – it’s spring! The Capital Region's Good Food Summit is the annual coming together of the Good Food Network of leaders from community organizations, local government, food and farm industry, funding agencies, and health and education sectors to connect and better align our work. Come hear about policy, planning, education and action projects that address local issues with local solutions. Click here for 2016 Good Food Summit 1-Page Printable Program. Click here for 2016 Good Food Summit full detailed program. Register below or if you prefer to pay at the door contact Jelena Putnik, CRFAIR Outreach and Events Coordinator for more info at jputnik@crfair.ca. Having difficulties registering below? Click here. CRFAIR is hosting the ever-popular zucchini races at the Saanich Fair this labour day long weekend. Join the fun from 11:00 to 2:00 on Saturday and Sunday to make us part of you day at the fair this year. We will also be launching our first annual zucchini growing contest. Pick up your free packet of zucchini seeds and get growing next spring!